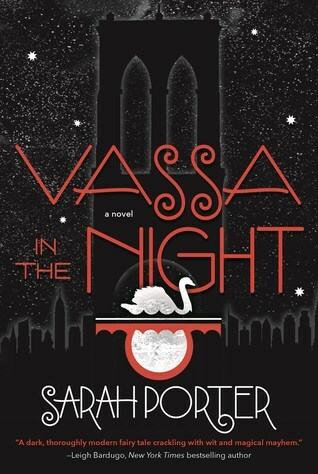 The Book Rat: Trailer Reveal + GIVEAWAY: Vassa in the Night by Sarah Porter! Trailer Reveal + GIVEAWAY: Vassa in the Night by Sarah Porter! You're probably already at least somewhat familiar with the book Vassa in the Night by now; after all, I've been sporadically pushing it in your faces for a couple of months now. Between my First Impressions, my review (glowing! And oddweirddisturbingdark...), and not one but two haul videos (and a TBR! ), I've been sharing this strange, dark little book every chance I get — and now I've got an even BETTER way to share it with you! It is my great pleasure to get to reveal to you the (gorgeous, eerie) trailer for the book (that music! ), which you can check out right now, for the very first time, below! Along with the trailer, Tor has created teasers featuring everyone's favorite vaguely creepy, fully hilarious animate doll, Erg. Erg is sharing her "little wisdoms," because she cares about you and wants you to succeed, and also she wants you to share your food with her, please. Because the people at Tor are so amazing, and because I loved this book and think that you might, too, we're giving you a chance to win a copy of your very own! Now, as I mentioned, I shared this in not one, but two hauls, meaning that I have two copies of this dark little gem! So I'm tossing my second copy into this giveaway as well (since I forgot that I'd intended to include it as a giveaway in my review... oops! ), meaning that your chances of winning are automatically doubled! To celebrate the release of the trailer & teasers, and the release of the book (today! ), the awesome folks at Tor have offered up a finished copy for one lucky TBR reader, and I'm offering up a gift-wrapped (in branded Vassa paper!) ARC to a second lucky reader! This giveaway is US only, and ends September 27 at 11:59pm EST. Please do not leave any email addresses or sensitive info in the comments. These will be deleted. Now those were fun to watch. I can see by the tone set in the clips that I'll enjoy digging into this darker fairytale retelling. Oh neat! Double chance. Thanks, Misty! I've had this one on my TBR since before you began hyping it, but you've got me really excited!!! I've had my eye on this book since... when? Did I maybe first hear about it through you? XD In any case, few things catch my eye like a fairytale retelling. I look forward to giving this one a try. whoo hooo@thanks for the giveaway - read the review - loved it. ok, I didn't say why I want to read it- I love the mix of fairy tales - stepsister and Baba Yaga? Yes please. I've been wanting to get this book for awhile. I love retellings especially the dark and little disturbing kind!